Don’t Get “Just Another Banner!! 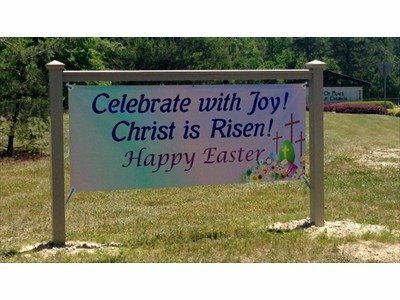 Get Your Message Noticed with a High Quality, Custom Banner! When you want to make a special event even more spectacular, tell everyone by getting a custom banner to mark the event! 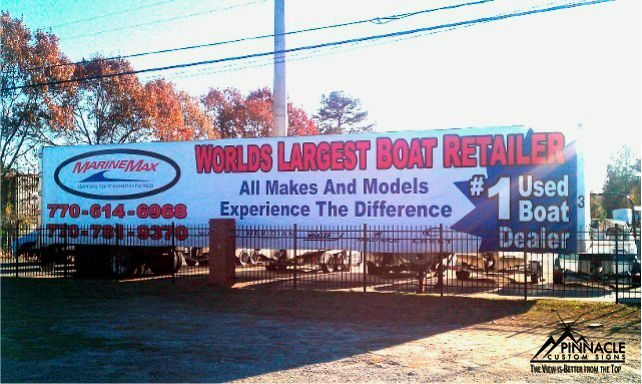 Many sign or print shops can provide you with “just another banner.” But, if you really want to make that banner special, Pinnacle Custom Signs is the obvious choice in Atlanta, Buford and Flowery Branch and beyond. We can print 60 inches by 150 feet, so we can take care of your needs. 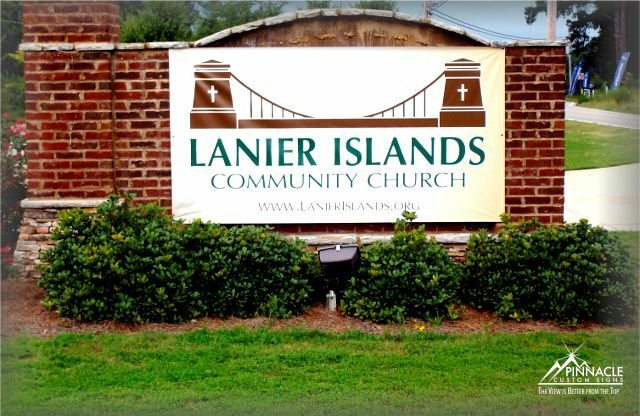 Get your Message Noticed with a High Quality, Custom Banner! We want you to be proud of your banner when you display it. This is why we take our time to work with you to make sure it is exactly what you need and sends the right message. 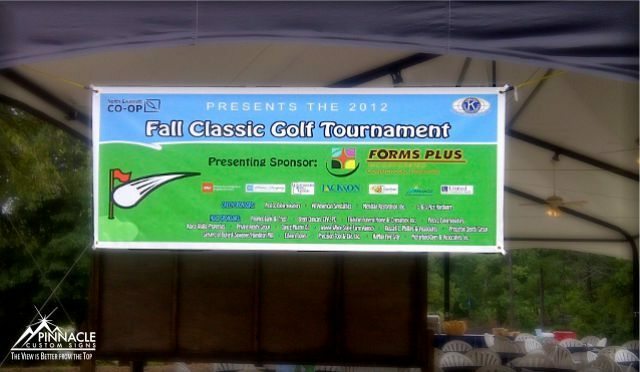 We can create banners for all types of special events. But don’t let the list of popular items limit you. Banners are message boards and are one of the smartest ways to get your message in front of as many eyes as possible. They get the attention of people on foot, in a car, or in your store. 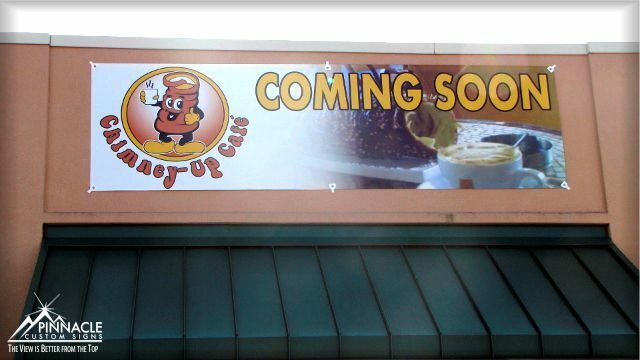 Additionally, these signs can be created on a tight timeline and at a very affordable cost. 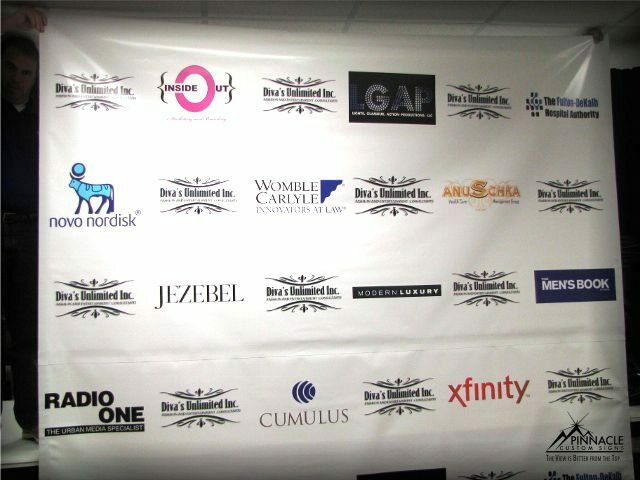 To make sure you get a custom banner for your event, Pinnacle Custom Signs can design, print and install before your deadline. 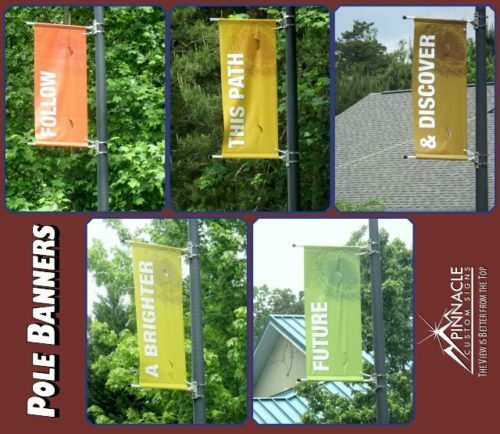 Marketing with banners is beneficial for schools, service providers, churches, retailers, and many other industries. 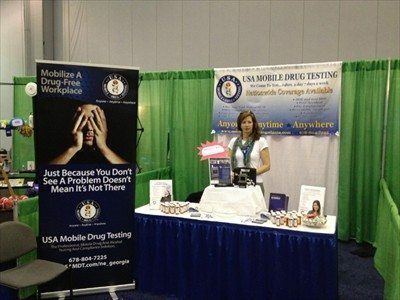 Banners are a must if you are exhibiting at a trade show or a special event, like a community festival or parade. 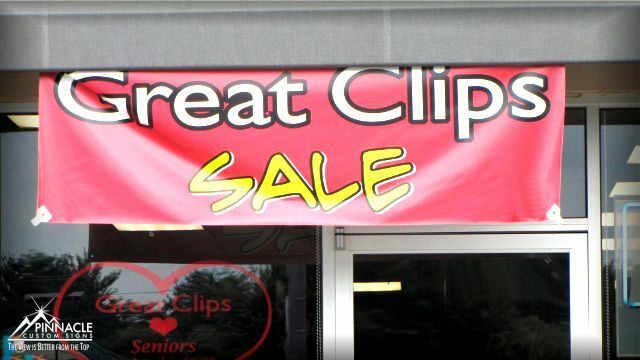 Retailers can use custom banners to promote special offers, seasonal deals, and discounts on specific items by just switching out the banner in a dedicated space. 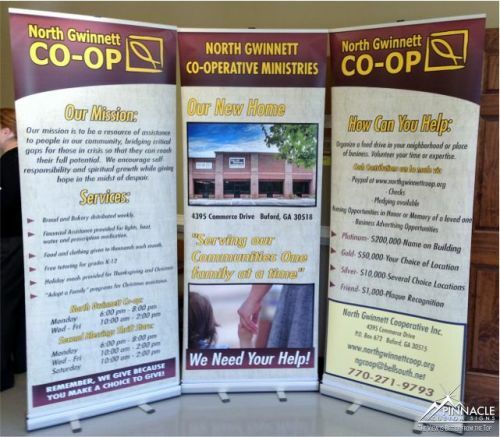 Grand openings and fund raisers can utilize custom banners for a successful outcome. 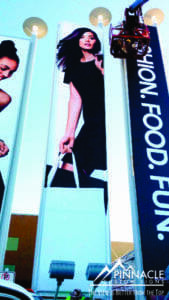 Vinyl Banners main structure of vinyl banners is often a polyester grid of fine mesh known as scrim. This gives the banner strength. The heavier the mesh, the more visible the mesh grid, the stronger the banner. This grid is then coated with PVC. Banners that are made without the scrim mesh are less expensive and not as durable as a scrim vinyl banner. Additional construction options include reinforced hems, pole pockets and reinforced corners. You can order full color banners or text only banners. Full color banners can have unlimited text, graphics and backgrounds. Canvas Banners are used as an indoor banner application that is cotton-based canvas banner material usually has a white PVC coating on one side to allow printing. It creates nice digital prints that are attractive and durable. These are best used for indoors only as the exposed cotton back doesn’t tolerate moisture very well. The texture they have is similar to a painted canvas. They are commonly used for high end displays and backdrops. Anti-curl flat banners that do not curl on the edges and it is ideal for retractable banner stands or for hanging banners. We can print full color digital graphics on the material on this super flat vinyl. These are used for trade show banner stands, trade show banner back drops and a variety of custom indoor banner applications and can also be used outdoors for short term low wind areas.. The mesh banner material is similar to the scrim vinyl banners in construction, however the spaces between the polyester grid are left open. This serves several purposes. 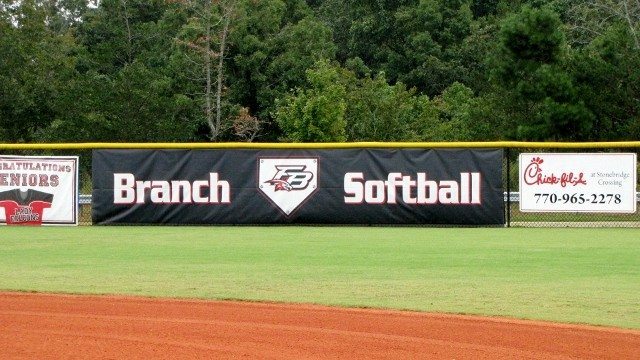 With outdoor applications, wind can present a lot of stress to a large, exposed banner. The larger holes in mesh banner allow the wind to pass through, easing most of the stress. Another benefit is for building wraps that cover windows. The holes allow light through so that the occupants of the building don’t get SADs. This material is highly recommended for long term outdoor applications and in windy locations. The hems and grommets are heat welded for standard production. Additional durable options are pole pockets, reinforced hems and reinforced corners. Fabric Banners are indoor banners that have a higher end look and feel than vinyl banners. A direct dye sublimation printing process is used on fabric banners. This means that the ink goes through the fabric instead of just sitting on top of the fabric. The result makes the colors bright and vibrant. These have folded sewn hem and grommets. Additional construction options include cut to size or pole pockets. 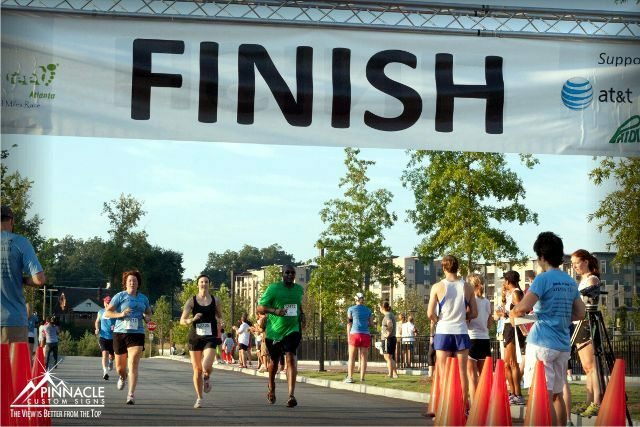 Choosing the material for your banner is the first step to your custom banner. All of our banners are made of high quality materials to insure your investment lasts for years. We have two in house printers that can get the job done. Outdoor banners are digitally printed with any image, text, photos, or designs you want can be featured on your vinyl banner. Display your corporate logo and name on a banner to help boost your name recognition. You can build brand awareness and highlight your top services and goods with full-color graphics. 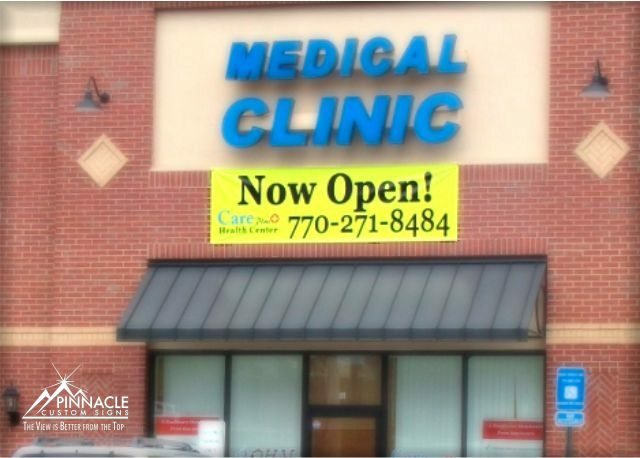 With cut vinyl graphics, you can even change the information on your banners as different units come available in your office building or apartment complex. But don’t let this list of popular banner types limit you. We can create banners for all types of special events. The next time you need a banner for a special event, give us a call. If you’d like for us to contact you about a custom banner, please complete the form below and click the send button. 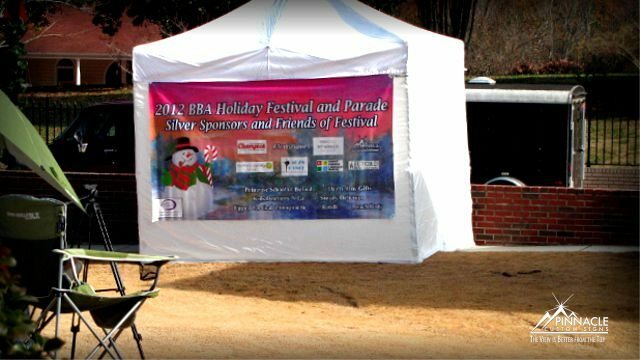 Or, you can call (678) 714-8700 and let us help you to design a perfect banner for your special event.